Welcome to my live WWE Hell in a Cell blog, where I&apos;ll post thoughts on the show throughout the night as it airs. 8:05 PM EDT:Michael Cole welcomes us to the show an announces a sold out crowd at the American Airlines Center in Dallas, TX. The announced number is 15,303. They&apos;re opening with Dolph Ziggler vs. Cesaro in a 2 Out of 3 Falls Match for the WWE Intercontinental Championship Match. 8:10 PM EDT: Cesaro did the Cesaro Swing and got a huge pop but Dolph countered and pinned him to win the first fall. A lot of good technical wrestling to open the bout. The problem with doing the Giant Swing is it garners an immediate pop, so the crowd seems a bit confused who to cheer. 8:17 PM EDT: Cesaro&apos;s head is completely shaved bald, even more so than normal. I like it and his strength has really been on display here. From a powerful punch to Dolph&apos;s temple to a huge powerbomb, it&apos;s clear Cesaro has elite strength. The crowd started the "this is awesome" chant following a Cesaro suplex on Ziggler on the middle rope. Cesaro is still getting babyface reactions but the crowd is appreciating the bout for what it is. 8:20 PM EDT: Cesaro kicked out of a Ziggler Fameasser and Cesaro connected on his trademark European uppercut. Cesaro landed a classic backbreaker before attempting a Nuetralizer. Ziggler countered with a superkick and Zig Zag to win the falls consecutively. This was a great opening match, highly athletic. If we&apos;re going to knit-pick, it&apos;s Cesaro doing the babyface moves when he&apos;s supposed to be a heel. He won the crowd with the Giant Swing and had them eating him up with his constant power moves. Ziggler, however, remained over and got a very credible win in this match. The commentators tried to play up Cesaro&apos;s frustration but that didn&apos;t translate live. 8:22 PM EDT: The commentators just shamed anyone that bought the show on pay-per-view. Michael Cole thanked them for ordering but basically told them they got ripped off. King&apos;s face was hilarious. A horrible marketing technique. We&apos;re going to have an update on WWE Network subscribers on Thursday but boy do they seem desperate. 8:24 PM EDT: Triple H told Randy Orton that Seth Rollins is exactly like him. 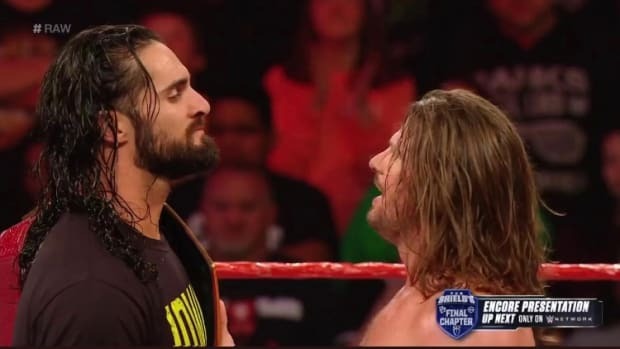 He said what happened on Raw was two Alpha Males trying to prove that their dominant. They&apos;re clearly laying the framework for an Orton face turn and a program with Seth Rollins. Hunter told him to focus on John Cena. Orton told him, Kane and Stephanie McMahon that he would do it their way but if they don&apos;t eventually deal with Seth Rollins, he will. This program is officially "coming soon." 8:30 PM EDT: Jerry Lawler said he believes Brie vs. Nikki Bella is the ultimate sibling rivalry they&apos;ve ever had in WWE. Really? Seriously? Bret Hart vs. Owen Hart! We can look it up and watch every minute of it for only $9.99! But it&apos;s NOT Brie vs. Nikki Bella. Not in any world. Ever. 8:35 PM EDT: Nikki went over with the Rack Attack in under 5 minutes. The crowd cheered her, I guess there aren&apos;t heels in Dallas? 8:47 PM EDT: The crowd is trying to get behind The Usos in the WWE Tag Team Championship match. We&apos;re now three deep and there&apos;s been no sign of heat, I&apos;m hoping the support of The Usos vilifies Gold & Stardust. However, they just cheered the powerslam of Goldust and are currently silent with Stardust locking in a headlock. 8:52 PM EDT: The crowd chanted "this is awesome" in reaction to The Usos&apos; high flying moveset. 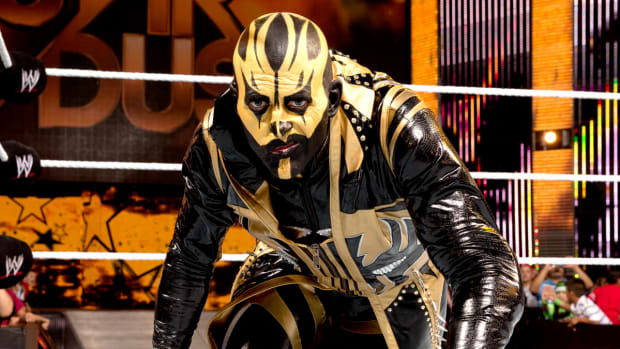 Stardust hit an illegal blow with the referee&apos;s back turned and Goldust got the pinfall to retain the belts. It was a fun tag bout but it&apos;s still very noticeable about the lack of heat from the crowd. I noticed people clapping as Gold & Stardust made their way to the back. Perhaps people are just disengaged with the current storylines and simply reacting to the in-ring action? It will be interesting to follow. 8:57 PM EDT: They&apos;re doing Randy Orton vs. John Cena Hell in a Cell next, which mean Seth Rollins vs. Dean Ambrose will close. This is absolutely the right thing to do from all sides. From making Rollins and Ambrose seem like a "big deal" (because it is) to not always showing favoritism to the 1A and 1B. I don&apos;t know if this crowd would turn -- they seem so nice -- but that would be a huge risk if they tried to close with Orton/Cena. However, that&apos;s not the case and I&apos;m glad to see Orton vs. Cena up next. 9:07 PM EDT: Well I guess the first note we can make is John Cena is wearing black shorts, which is something out of the ordinary. JBL talked about them being the two best of a generation and it&apos;s true. I talked about it last week in Ask WNW and while fans today don&apos;t greet another Orton/Cena match with excitement, history will be kinder. 9:12 PM EDT: Orton just told someone at ringside to "shut up." I swear I heard people saying, "let&apos;s go Randy." The dueling Cena chants kicked in, so at least we can see this crowd is capable of producing heat. It&apos;s funny it&apos;s against Cena, I just hope they engage more. They&apos;ve come across really flat tonight. 9:16 PM EDT: We just got a Tim White reference on commentary. When Cena was down the crowd changed RKO at Randy Orton. I didn&apos;t like Cena&apos;s bump off the apron onto the cage, it looked like he jumped down into the cage on his own freewill. Match has been OK so far but they need to step it up, especially with what I&apos;m expecting from Rollins and Ambrose. 9:19 PM EDT: FINALLY Randy Orton is garnering heat. He&apos;s the first heel to get it tonight and it&apos;s after completely dominating the match against Cena so far. Shortly thereafter he hit the RKO on Cena when Cena went off the ropes. Cole reacted, no matter what you think of Orton, "it don&apos;t matter." 9:24 PM EDT: Orton just took a bump on the steel steps in the ring. Either 1) his back is fine or 2) he&apos;s really hurting now. The RKO from out of nowhere was pretty nice. He&apos;s mastered it from everywhere. Literally. Check the Vines. 9:28 PM EDT: This has been a really good match, my opinion has completely changed over the course of the last 10-12 minutes. Orton drew heat from a cold crowd, Cena went crazy and nearly killed Orton by throwing the steel ring steps out at him and they&apos;ve been extremely physical. It&apos;s easy to criticize someone like Randy, who has been protected so heavily throughout his career, but he really is a master of his craft. They also just did a really cool spot where Orton hit an inverted RKO out of the Attitude Adjustment in a counter. I&apos;ve never seen anything like that. 9:31 PM EDT: John Cena beat Orton with an AA through a table so he gets ANOTHER opportunity at Brock Lesnar for the WWE World Heavyweight Championship. They listed Cena as the No. 1 contender so this is going to happen soon. It looks like they&apos;re just delaying what they were going to do here and going to do it in December at TLC. As for Orton, I&apos;m expecting a turn and a program with Rollins. 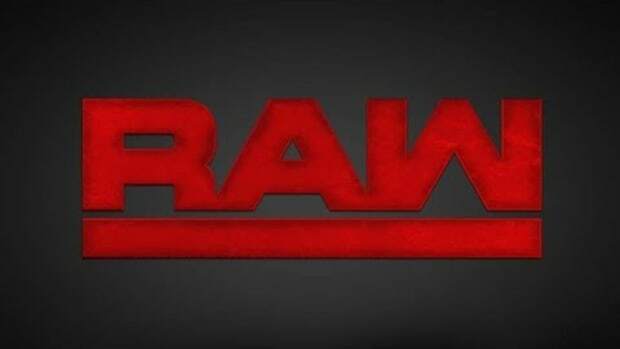 Maybe after Survivor Series but it&apos;s coming. 9:40 PM EDT: Mizdow is hilarious, mimicking The Miz. I plan to address his gimmick in the next WNW Premium Mailbag, how he&apos;s able to take very little and make a lot out of it. A split with The Miz has to be coming though, because he always ends up in Miz&apos;s way. it&apos;s just a shame how far a former Money in the Bank winner has fallen. 9:43 PM EDT: The crowd kind of reminds me of the crowd at a baseball game with their reactions (or lack thereof) to Sheamus vs. The Miz. There doesn&apos;t seem to be a lot of interest in the bout but it&apos;s been well worked up to this point. 9:46 PM EDT: "Mizdow is Awesome" is the chant, what&apos;d I tell you? Sandow is like Santino Marella in that he can take a complete joke of a gimmick and make it entertaining. It just makes me wonder what if they really got behind Sandow, imagine what he could be then. 9:49 PM EDT: Sheamus retained the US title after hitting the Brogue Kick on The Miz when he went off the ropes. Again, a well worked bout but the crowd cared more about Mizdow. A fact that became very clear when Sheamus held up Miz and did the YMCA, in which Sandow mimicked every move. 9:52 PM EDT: They did a backstage segment where Nikki Bella dumped a smoothie over Brie after Brie brought it to her just how she asked for it. Big Show vs. Rusev is up next. 9:57 PM EDT: Lana is showing the guys how it&apos;s done. Granted, she has a strong advantage with the Pro-Russian gimmick in the heart of Texas but she drew a heavy heel reaction. Big Show&apos;s entrance interrupted a rendition of the Russian National Anthem, which would have likely took the heat to a nuclear level. When I see Lana, I see a star on the mic. She will have a future after Rusev as long as WWE utilizes her properly. 10:02 PM EDT: Big Show channeling his inner Sgt. Slaughter with a camouflage singlet. Rusev suplexed Big Show, even with help, that was impressive. The crowd is heavily behind Big Show with "USA" chants. Rusev proves his athleticism with a dropkick. 10:05 PM EDT: Mark Henry came to ringside and raised his fist, I thought Big Show had a stunt double. 10:08 PM EDT: Big Show tapped out and the protection is still on Rusev. He&apos;s a great talent, very athletic. I&apos;m not high up on the gimmick but there is no doubting his athletic ability and versatility. Big Show has made a career as a versatile big man and Rusev is even more so. 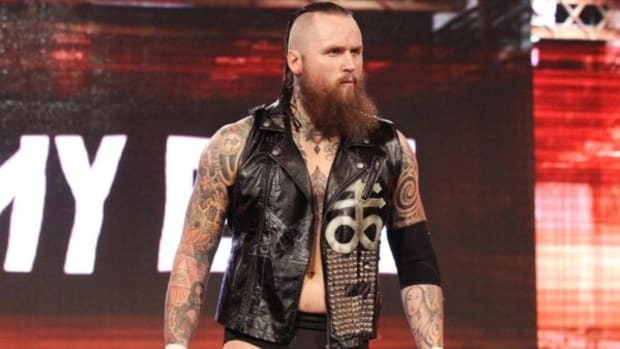 His stock is soaring following this win and WWE just might have their next big midcard act (and maybe more). 10:19 PM EDT: AJ Lee is a great in-ring worker. Ok, there I said it. Flame me (you can&apos;t, comments are off). I don&apos;t care, she can flat out go. Paige isn&apos;t a slouch either but it&apos;s the talent of AJ that is really on display tonight. 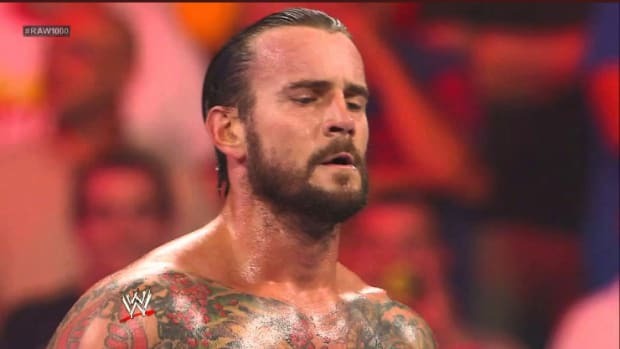 It doesn&apos;t matter how much the crowd chants "CM Punk," all of AJ&apos;s work is calculated and on point. Her submission holds, tornado DDTs, etc. A very high quality moveset. Paige tapped in the Black Widow. Paige and Alicia Fox split after the bout. 10:28 PM EDT: So much for Ambrose taking it easy, he climbed to the top of the cage and Seth Rollins isn&apos;t even out yet. My biggest fear with this bout is I&apos;ve set my expectations too high. I&apos;m going in expecting a Match of the Year candidate, so we&apos;ll see what happens. 10:33 PM EDT: Jamie Noble and Joey Mercury, as the stooges, were forced to climb to the top of the Cell to get Ambrose. Rollins follows and the chaos is underway. Rollins is getting good heat as the stooges take turns in assaulting Ambrose. This is a very unorthodox way to start the bout but very effective. 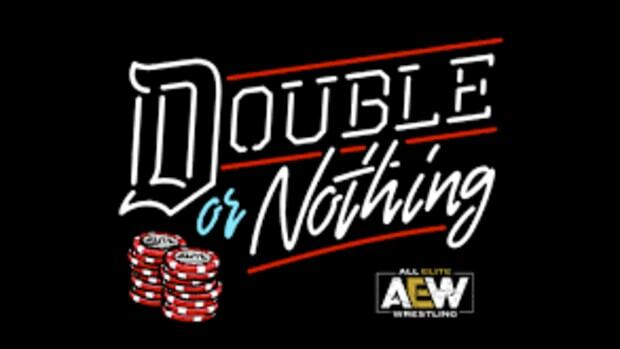 10:36 PM EDT: Please note that less than 10 minutes in that Dean Ambrose and Seth Rollins have destroyed both announce tables after bumping off the cage. "This is awesome" chants from the crowd. I believe it was Ambrose that said they were going to try something different, which this certainly is. The spot was Ambrose giving Rollins a headbutt, sending Rollins through the Spanish announce table. Ambrose more or less jumped through the main announce table. Ambrose was trying to make it look like he lost his balance but he didn&apos;t want to miss the table. 10:40 PM EDT: Both were put on stretchers and they talked it up on announce the match was over before it got started. Of course this was to just set the tone about how insane Dean Ambrose is. He "refused treatment" and peeled Rollins off his stretcher. That bump is how the match will start. 10:44 PM EDT: The crowd seems stunned but they&apos;ve been in and out of the show all night. It was an unorthodox way to start the bout (even a HIAC bout) that has me legitimately worried about their health. Rollins has already taken another stiff bump into the cage and Ambrose is being portrayed as out of control and unstable. 10:47 PM EDT: A few minutes later and another big spot with Ambrose delivering a flying elbow onto Rollins on a table. The table is crushed and the stooges yell at Ambrose from outside the HIAC structure. Kane comes out and sprays a fire extinguisher in Ambrose&apos;s face. This allowed for Rollins to put Ambrose through a table. 10:50 PM EDT: Near fall here after Rollins delivered the Curb Stomp on his former Shield partner. The crowd doesn&apos;t know what to do, so they&apos;re chanting for Jamie Noble. Rollins puts a chair over the back of Ambrose. 10:53 PM EDT: The feed went black and someone speaking in another language is heard. It&apos;s clearly to reintroduce Bray Wyatt. The lights come up and Wyatt destroys Ambrose in the ring and the feed goes black. It comes back and Wyatt spider walks and hits Sister Abigail. Rollins covers Ambrose and gets the win. 10:56 PM EDT: This wasn&apos;t a Match of the Year candidate but it did a couple of things. 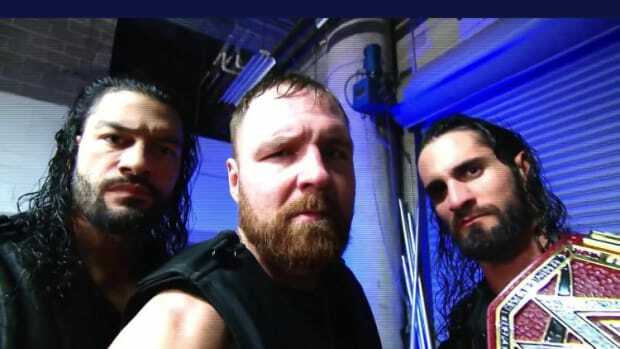 First, the bout reiterated what we already know in that Dean Ambrose and Seth Rollins are insane and don&apos;t care to go to another level, even if it means sacrificing their bodies. Next, it was done to reintroduce Bray Wyatt and get heat on him. Non-finishes in pay-per-view main events used to be inexcusable but for $9.99, they&apos;re something WWE feels they can get away with doing. It&apos;s a different day and one we really can&apos;t complain about because we no longer pay $54.95 per show.